Hello and welcome to our web site! Kirkistown Castle Golf Club is a unique Irish Links golf course and clubhouse situated on the eastern shores of County Down, Northern Ireland on the beautiful Ards Peninsula. The Club, now in its 116th year, has rolled with the times and has been an enduring central landmark within the townland of Kirkistown and the small village of Cloughey. 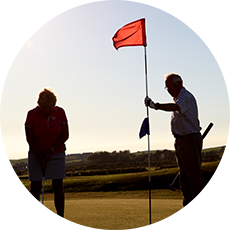 Our current membership consists of approximately 800 members across various categories from the young and young at heart, to the golfing fanatics as well as those who simply enjoy the food, drink and great craic that makes our Club atmosphere so enticing. Testimonials This is a links education that will be forever seared into your memory. - Kevin Markham, Just a quick note to say thank you for giving us the opportunity to play your beautiful course. A proper links. The greens were fantastic and we all struggled with the elevated ones. The members were also extremely friendly - Tomlins Brothers, We had a fabulous day. The course was in perfect order and the lads fully enjoyed the experience. Complimemts to the team - the greens were perfect - a bit of a challenge. I can assure you that if I am involved we will be back next year. I have already spread the word - Fergal Collins. 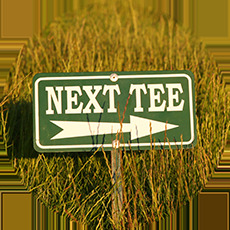 Director Time Associates, Thank you for arranging a tee time for Margartet and myself on Wednesday. We both felt the course was in super condition and a fair but difficult challenge. We had already played Portmarnock Links Seapoint Baltray RCD and Ardglass on our trip and your greens were the best we encountered. We were made to feel very welcome by everyone at Kirkistown Castle and very much enjoyed our day - Chris Archer - Droitwich GC, On behalf of all the members of the Rathcoole Hackers Golf Society I would like to say a big thank you to everyone who helped make our outing on Sunday such a fantastic day. Since our Society was formed this is the most welcome we have been made to feel at any venue. As this was our Captain's Day we could not have wished for any better place to hold it. The course was a fair test for everyone with some super scores and the food and hospitality was second to none. You really do things well at Kirkistown Castle and I am looking forward immensely to returning - Steven McCord, I had a marvellous time despite highly unsuccessful scoring on your classic links which undoubtedly boasts a great set of greens for design and spirit and the most intriguing challenging and correct (both for location and design) set of bunkers one could imagine. 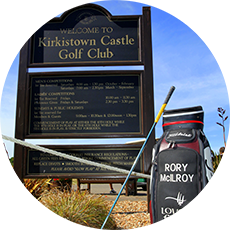 Kirkistown Castle golf is great golf with some of the most memorable holes in the game such as the twin terrors of the second and the tenth and a beguiling smile promising a good score but thwarting the unwary suitor. 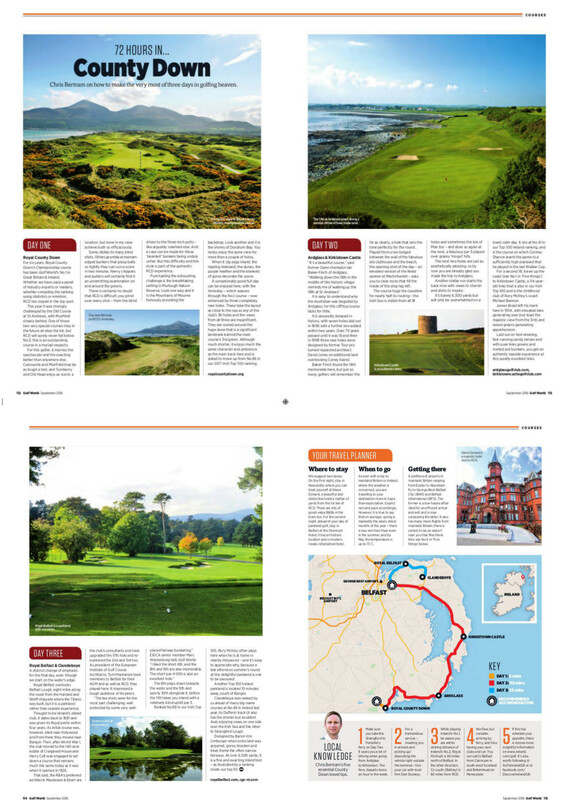 Yours is a links one could happily play every day for the rest of one's life - Pat Ruddy: Course designer of the European Club Glasheddy Ballyliffin and Sandy Hills Rosapenna. This page is required for the the homepage diary to show. 17 May Mary Peters Qual. 18 May Mary Peters Qual.